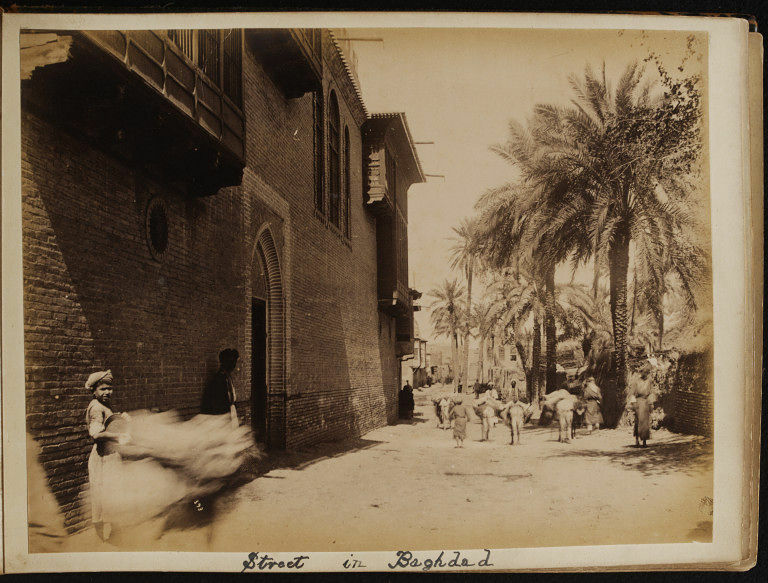 The photograph of a Baghdad street is part of the C.R. Smith archive. This small archive consists of an album of 60 mounted albumen prints (predominantly portraits and topographical views, taken in Iran and Iraq), a further 24 loose photographs, and a series of letters and memos. These document a correspondence between Charles R. Smith (born 1866) and various colleagues made throughout 1901, when he was approached to join a new carpet enterprise in Tabriz. He duly left Sultanabad where he had been working for the Persian Carpet Manufacturing Company, but by July of the same year he had returned to his native Kidderminster in England. It is not known if the Tabriz business plan was ever realised. Most of the photographs in this album are marked with a small order number, written onto the original negative. This numbering system was the working practice of Antoin Sevruguin (c. 1830-1933), also known as Antoin Khan, one of the most successful commercial photographers in Iran at the turn of the century. Based in Tehran, Sevruguin photographed people, landscapes and architecture throughout the country. It is therefore clear that most of Smith's album photographs were stock images bought from Sevruguin's studio, and not taken by Smith himself. This contrasts with the Ronald Graham album (now in Harvard University Art Museum), which contains photos taken by Graham with a Kodak camera, when he visited Iran in 1897-1899. 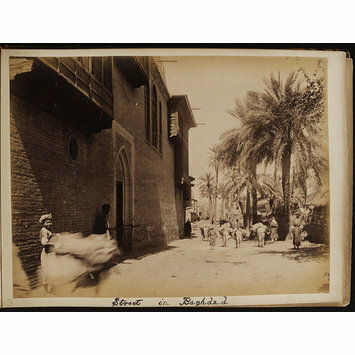 Photograph, albumen print, captioned 'Street in Baghdad'. Russell Harris and Isabel Miller, "The Sevruguin Photographs", Asian Art (February 2011) 6-7. Melanie Venes and Jennifer Wearden, "A Persian Venture", Hali 148 (2006) 60-61.